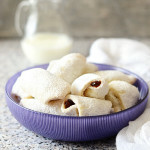 Thumbprint Cookies with Raspberry, Blueberry and Apricot Jam – delicate hazelnut buttery cookies filled with various fruit jams. True taste of Christmas! 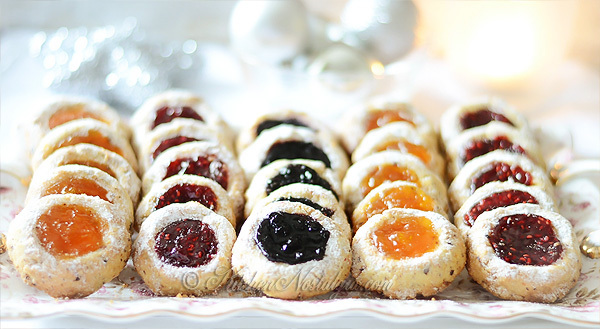 Thumbprint Cookies are classic Christmas butter cookies that are made over and over again, every single year. This recipe is different then others because it contains ground hazelnuts which give cookies much more flavor. 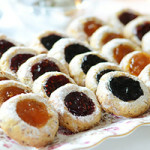 Half-baked cookies are filled with different types of jam like raspberry, blueberry and apricot jam. 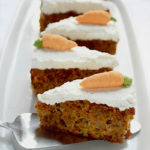 That is why, after baking, when you place them on serving tray, they look so colorful and pretty. 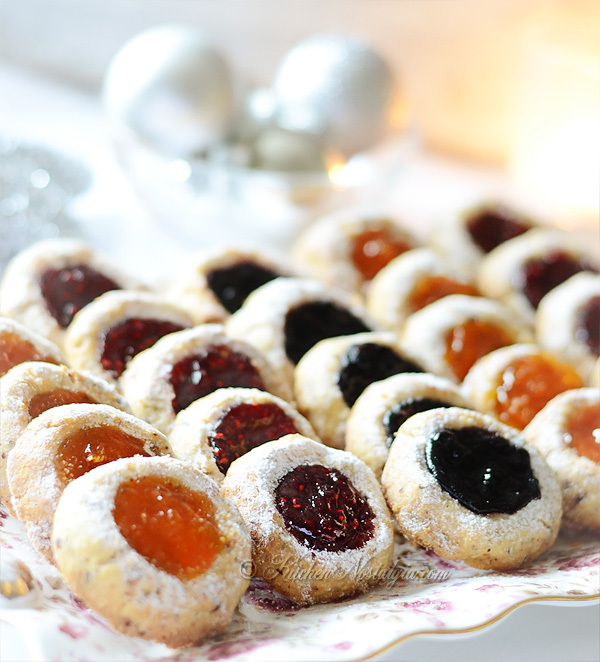 Delicate shortbread Thumbprint Cookies are not only nice looking on your holiday table, they will also melt in your mouth. 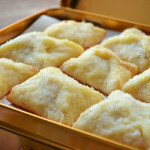 Mix butter and sugar until fluffy. 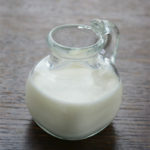 Add egg yolks, salt and vanilla extract and mix briefly. Combine flour and hazelnuts, add to butter mixture and mix until just incorporated. Form a dough into a log and wrap in plastic foil. 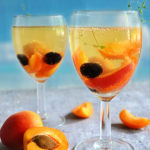 Chill in refrigerator for 2 hours. Cut the log into equally sized slices. Form the ball out of each slice and dent it in the center with your thumb. Place cookies onto a cookie sheet lined with baking paper. Bake for about 7 minutes in 375 F (175 C) oven. 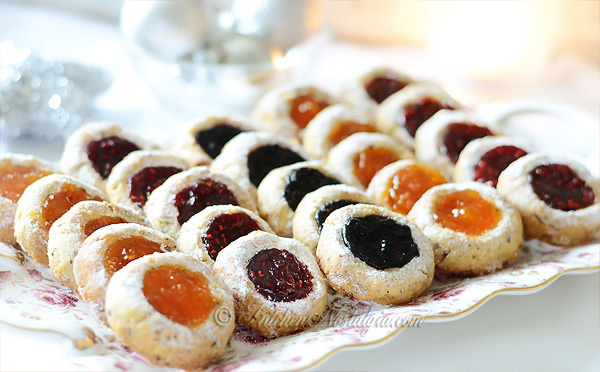 Fill each thumbprint with jam, return cookies to the oven and bake for another 5-8 minutes or until edges of cookies become golden. 16 Tbsp is 2 sticks; this recipe is not clear on how much butter is needed…is that 1.5 sticks + 2 Tbsp in addition to the 16 Tbsp? It is 200 g of butter which is equal to 7 oz butter OR 1 1/2 stick + 2 Tbsp butter.